Gorgeous Gavin Doherty dress for sale. Very Classy Purple velvet and white 5 panel dress with lace frill. 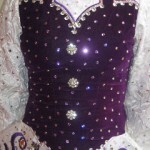 The unique velvet strap bodice is outlined in AB crystal rhinestones and highlighted with light violet stones and 3 crystal buttons. 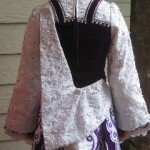 Sleeves and shawl are made of delicate white lace over satin. 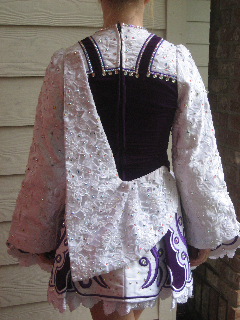 The dress is covered with hundreds of AB crystal, fancy spotlight and chessboard cut Sworovski crystal rhinestones. Very flattering elegant dress style, with wonderful stage presence. 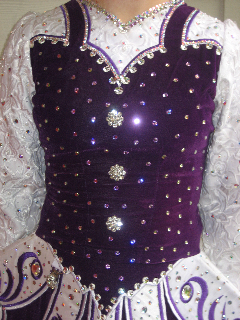 Comes with rhinestoned purple headband and purple cotton kick-pants. 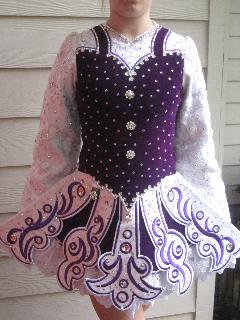 Skirt lining is purple and white stripe.